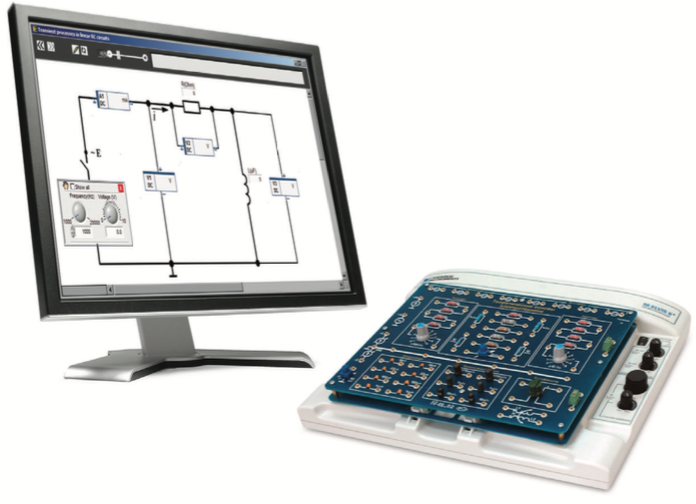 Students use hardware from the Integrator add-on board combined with NI ELVIS and LabVIEW software to generate a fully functional solution for teaching basic electrical electronics to students. In these labs, students will build and interface with electronics circuitry to experimentally learn the fundamentals of circuits.The Integrator Electronics Engineering Add-On Board provides a hands-on platform for teaching fundamental electrical engineering concepts including resistance, inductance, and capacitance as well as basic electrical theory. The student is guided with step-by-step instructions to each of the 22 included labs and will use the educational board to assemble the electric circuits, make the required connections of power sources and meters, and conduct experiments with the studied circuits. 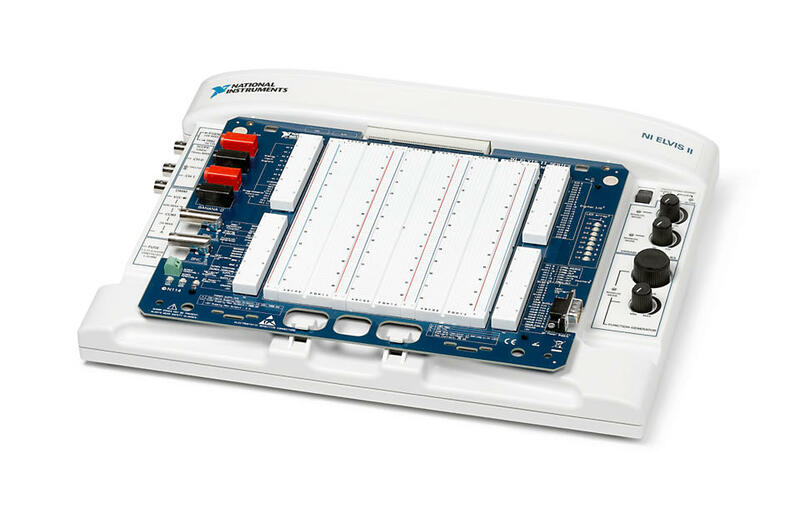 The student will collect, display, and analyze data through the provided LabVIEW-based lab software. With these labs, students can learn the operating principles of RL, RC, and RLC circuits. The student will experimentally learn basic electrical engineering concepts including power sources, resistance, inductance, capacitance, and transient circuits. Students interact with NI ELVIS hardware and virtual instrumentation to quickly measure and analyze data from the add-on board circuitry. Students experimentally verify Ohm’s Law for various currents and voltages in the circuit, plotting the I-V curve for a resistor as well as I-R of a constant voltage. Students experimentally verify Kirchhoff’s Current and Voltage Laws and measure the currents in various circuit branches and potential drops across the resistances. Students experimentally verify the calculation of the equivalent resistance for series-connected resistors. Students experimentally verify the calculation of the equivalent resistance for parallel-connected resistors. Students experimentally verify the calculation of the equivalent resistance for mixed connection of resistors. Students experimentally determine the DC voltage source impedance and plot its external characteristic graph. 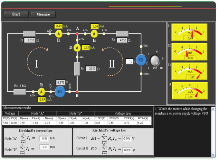 Experimentally determine the DC current source impedance and plot its external characteristic graph. Students learn the main properties and operation modes of an AC circuit with a resistive load. Students also determine circuit components parameters and learn their influence on the circuit operation. Students learn the main properties and operation modes of an AC circuit with series connected resistor and inductor. Students also determine circuit components parameters and learn their influence on the circuit operation. Students learn the main properties and operation modes of an AC circuit with series connected resistor and capacitor. Students also determine circuit components parameters and learn their influence on the circuit operation. Students learn the main properties and operation modes of an AC circuit with series connected resistor, inductor, and a capacitor. Students also determine circuit components parameters and learn their influence on the circuit operation. 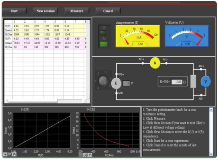 Students complete experimental verification of the equivalent capacitance calculation for series connection of capacitors. Students complete experimental verification of the equivalent capacitance calculation for parallel connection of capacitors. Students complete experimental verification of the equivalent inductance calculation for series connection of inductors. Students complete experimental verification of the equivalent inductance calculation for parallel connection of inductors. Students learn of resonance in AC circuits with a resistor, inductor, and capacitor connected in series. Students learn of resonance in AC circuits with a resistor, inductor, and capacitor connected in parallel. Students complete an experimental study of a circuit consisting of two inductively coupled coils (additive and subtractive polarities), testing the main concepts for series connection of inductive coils. Students complete an experimental study of a single-phase transformer in no load and short circuit modes, plotting the external characteristic. Students complete an experimental study of transient processes in a circuit containing a series connected resistance and an inductor. Plotting the graphs i(t) and v(t). Students complete an experimental study of transient processes in a circuit containing a series connected resistance and a capacitor. Plotting the graphs i(t) and v(t). 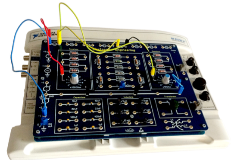 Students complete an experimental study of transient processes in a circuit containing a series connected resistance, inductor, and a capacitor. Plotting the graphs i(t) and v(t) of the capacitor and inductor. 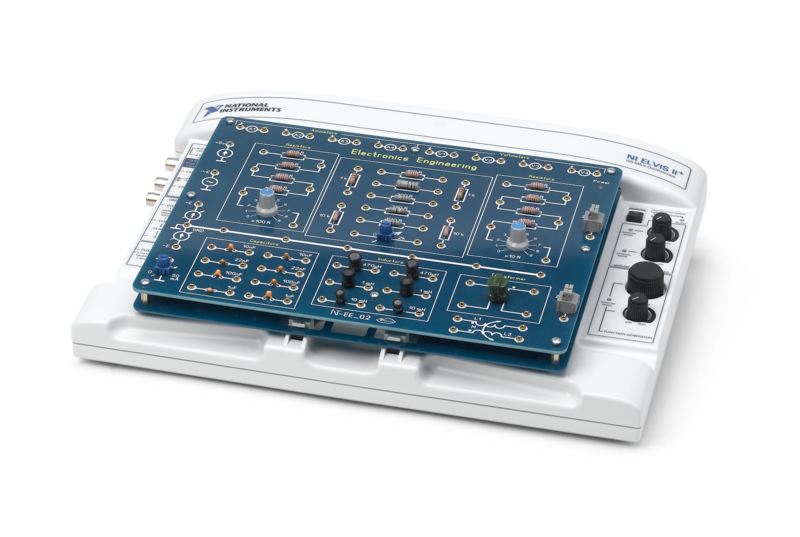 The Integrator Electronics Engineering Add-On Board provides a hands-on platform for teaching fundamental electrical engineering concepts including resistance, inductance, and capacitance as well as basic electrical theory conducted on a printed circuit board.